The FAZ family is growing and growing. 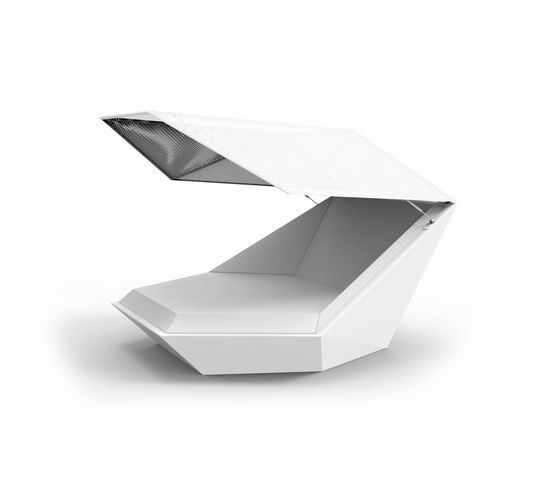 VONDOM now enters into the world of sunshade with Daybed, an elegant and comfortable sunbed with a double function for outdoor. Despite the large family of this collection; table, sofa, sun lounger, bank, chair, flowerpot... his creator, the architect Ramón Esteve has designed this new element, thinking about the sensation to have an ideal bed, for relaxing, sunbathing and enjoying in the open air, under a sunshade which protects from the harmful rays. As the other models of FAZ Collection, is inspired in the mineral forms that we could find in the nature, it recalls the figure of the crystallized quartz. Daybed Faz becomes a must for the day and for the night with Batyline ® technology for its distinctive umbrella and sunshade system. It also has outdoor sound system, through which you can enjoy an exceptional sound quality by simply connecting a Smartphone or via Bluetooth technology. A highly weatherproof system which you can create enveloping atmospheres.